Let’s not mince words: The Moots Farwell is an expensive bike. But you know what? Sometimes you get what you pay for. 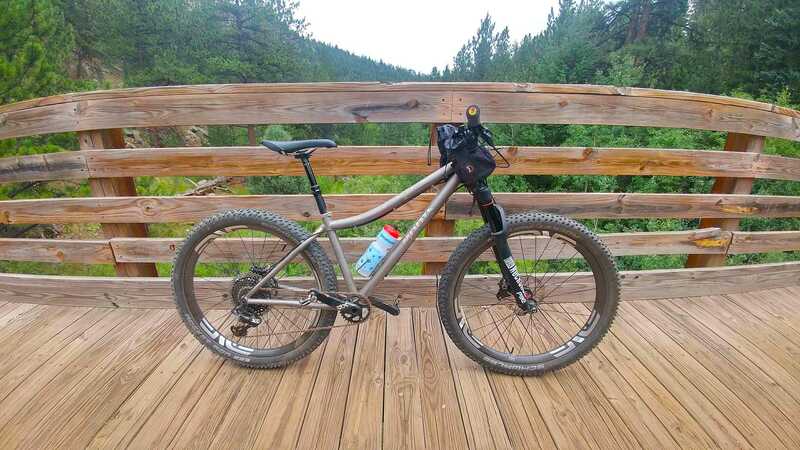 We put this gorgeous, handcrafted titanium machine to the test in the mountains of Colorado. So to refer to my time with the Moots Titanium 27.5+ Farwell as a minor upgrade would be a massive understatement. 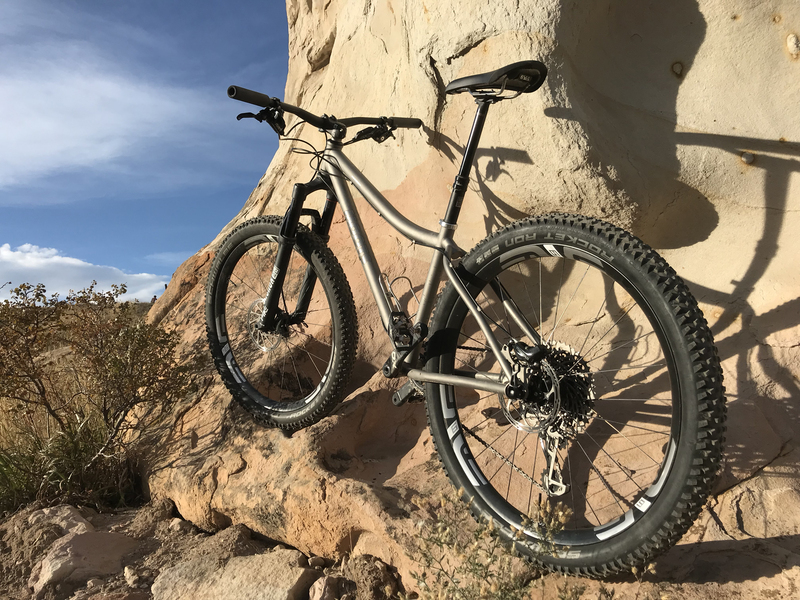 It was more akin to swapping a Honda Accord for a Ferrari — a beautifully crafted titanium Ferrari of a bicycle with carbon 27.5+ wheels and the latest in MTB technology. As a dedicated rider who always dreamed of throwing my leg over a bike like this, all I can say is that it was an absolute joy to experience. Wheels: If you’re going to make an upgrade to your bike, make it the wheels. For me, the Farwell’s Enve 9 carbon wheelset made the most immediate and noticeable impact on the riding itself. Stiff, light, and laced to juicy plus tires, I was beyond impressed at how much better a performance wheelset handled. This bike wanted to move, seemingly of its own accord, especially coming out of flowy corners. 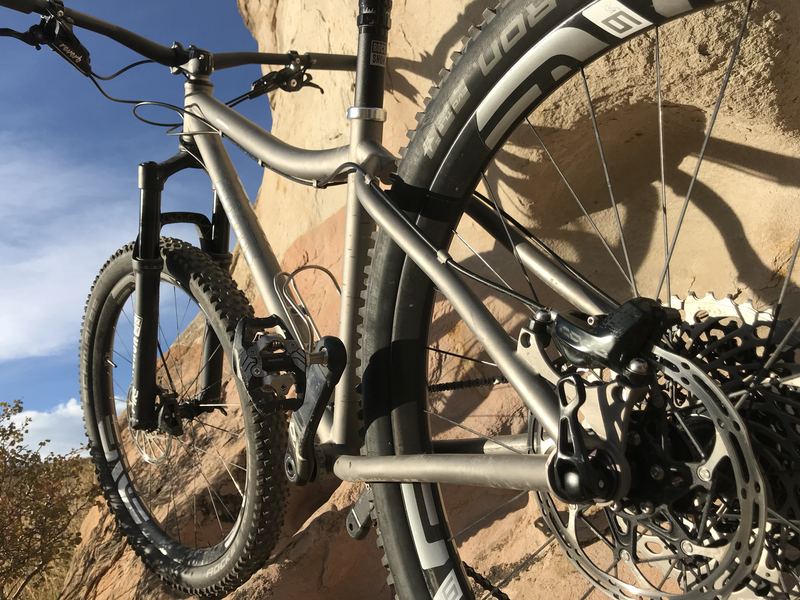 Geometry: There’s a reason the 27.5+ platform has emerged as an extremely fun and versatile option, and Moots nailed it with the Farwell. The combination of short chainstays and a slightly more slack headtube than what you’d traditionally see in a hardtail, plus a short, whippy stem, make for a burly yet responsive ride. 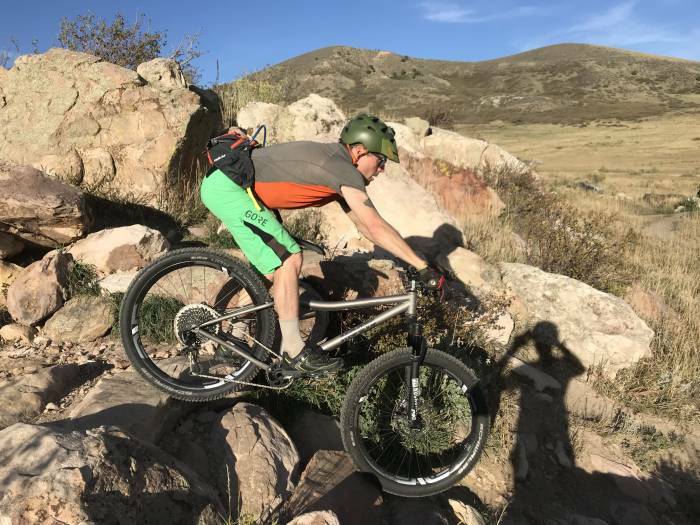 I was pleasantly surprised descending some of Colorado’s infamously chunky singletrack without a cushy full suspension. Beyond technical trails, though, I would just as easily point to the Farwell as an outstanding option for any major bikepacking adventure. To get equal parts incredible trail bike and multiday touring rig in one bike is extremely appealing and unique. 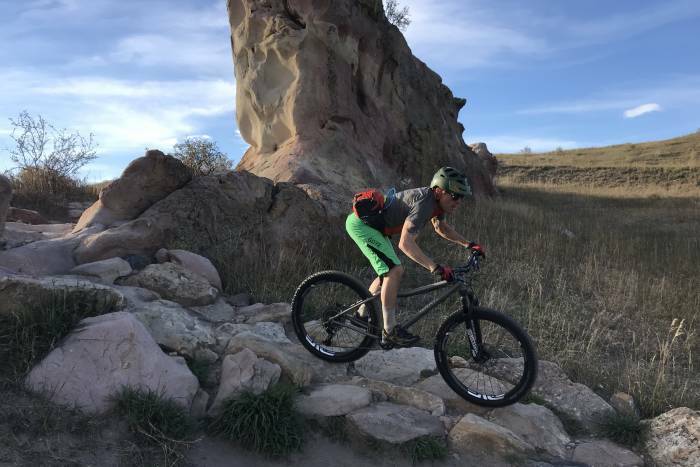 As a lifelong hardtail rider, I am used to the climbing power of a rigid rear triangle. 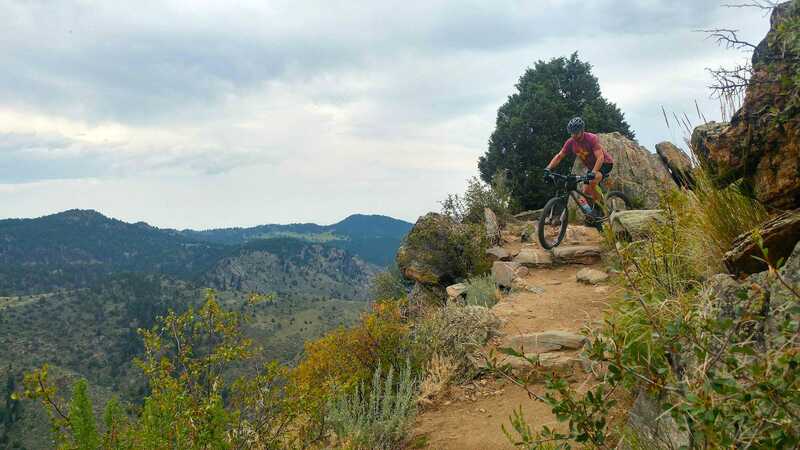 But due to the 68.5-degree headtube paired with 2.8-inch tires, climbing technical terrain was somewhat choppy. This is more a critique of the 27.5+ platform than the Farwell itself, but it’s worth noting. And don’t get me wrong, the bike climbs really well for a plus bike. But in Colorado, everything is steep and technical. This was literally the only area I found myself pondering a more traditional hardtail setup. Having visited the Moots factory in Steamboat Springs, I know how meticulous the brand is about its process, from design to manufacturing. It doesn’t spare any details, and the Farwell is no exception to that: high-end Shimano XT 8000 components, a bomber 120mm RockShox Pike fork, and one of the better dropper posts I’ve ever ridden in the Fox Transfer Internal Dropper. Not to mention the clean lines and classy aesthetic that Moots’ titanium frames are so wonderfully well-known for (pinches fingers and thumb together and gestures kiss towards the sky). When a trophy bike also manages to be a majestic all-purpose MTB machine, you’re in for a damn good time. Coming in at a steep $7,899 MSRP, however, the Farwell isn’t for everyone. But it’s not supposed to be. It’s a tippy-top-shelf performance bike that Moots engineered to absolutely rip. So if you’re looking for the Ferrari of 27.5+ mountain bikes, this it it. After nearly six years living and working all over Latin America as a cycling guide, Britten’s obsession with biking and traveling led to the creation of his own company, Revolución Rides, which offers immersive cycling trips all over Central and South America. Cuban rum, big climbs, and extra cilantro? Yes, please. He’s based in Denver.